Are you already in a tizzy trying to decide what to do for the upcoming holidays? Are you tired of the status quo? Maybe this is the year you just hop in your RV and forget all your troubles. 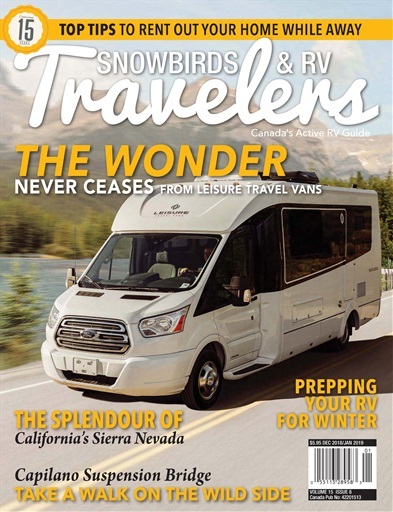 We hope you can use this issue of Snowbirds and RV Travelers to plan your winter escape — whether it be in a sunnier locale or somewhere closer to home, we can help you find the perfect destination. If you are dreaming of a trip that includes warmer temperatures, we have some fantastic stories on destinations in Florida, California and Arizona. If you really want to be free of it all, you can shed everything, including your clothes, at a nudist resort in Central Florida called Cypress Cove (see page 18). Let us know if you bare it all, but please don’t send pictures. Read about the Triangle T Guest Ranch in Dragoon, Arizona (page 54) for a fully- clothed, but still exciting resort experience. The second story on Arizona, Riding the Range, is also about cowboys in Arizona. The Capilano Suspension Bridge story (page 26) offers up a different kind of thrill - one that sees you 60 metres above the Capilano River in North Vancouver. 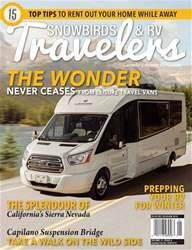 If you are looking for a new RV to take you away, see page 14 for a look at the new All New Wonder from Leisure Travel Vans. With its fresh, innovative design it might just be what you need. We wish you all the best with your winter getaways and we’ll see you next year. Tell us more about you by sending us a photo, writing an email or visiting us online. See page 62 for more information.